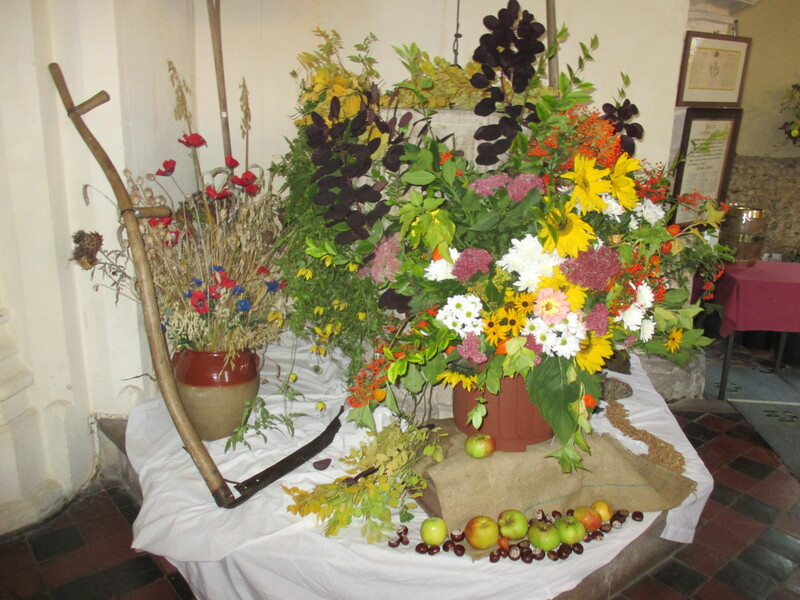 Held in the church in Saturday 3rd October and Sunday 4th October this was an opportunity for some members of Hoxne Heritage Group to demonstrate their flower arranging skills using the theme of harvests through the ages. 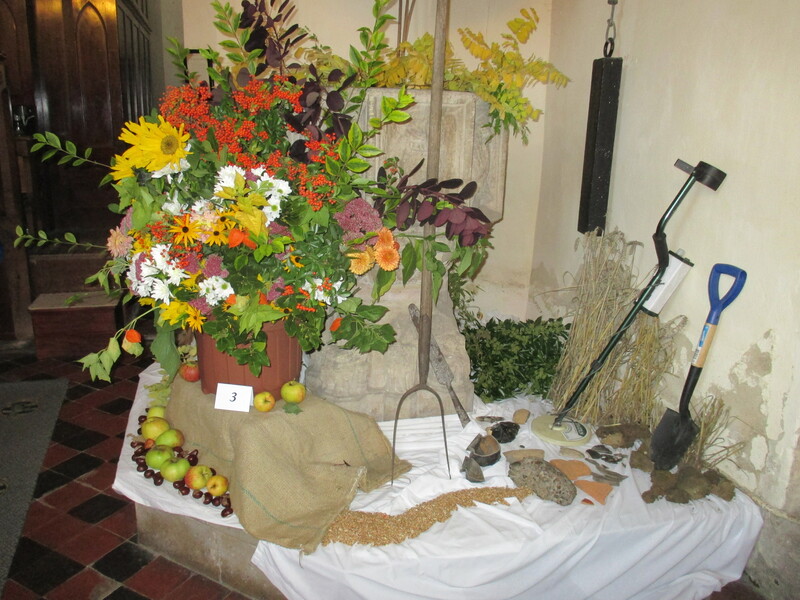 Using a variety of autumn flowers, foliage and other ‘accessories’ the display attempted to give an insight into how harvesting has changed notably through the equipment used such as scythes, the use of quern stones and how crops have evolved/ changed. A different interpretation of harvesting was also shown with the aid of a metal detector used for ‘harvesting’ the lost artefacts of previous local inhabitants. Thus emphasising just one of the many tasks of Hoxne Heritage Group in it’s quest to keep the past alive and meaningful to not only present but also future generations. On September 15th the Hoxne Heritage Group were honoured to host Rosemary Hoppitt to address our monthly meeting. Rosemary is an historical geographer and had written her PhD thesis at UEA in 1992 on the development of deer parks in Suffolk from the eleventh to the seventeenth century. Since that time she had researched even more records and we were fascinated to hear her account. Most Suffolk deer parks were less than 200 acres and belonged originally to the ecclesiastical elite between 1086 and 1602 and then to the lay elite and others. In 1602 there were 130 parks recorded in Suffolk, of which two were in Hoxne, two were in the South Elmham area and one in Homersfield. The old parks were situated on highland areas where drainage was poor – hence the site of the Hoxne Oldepark at Park Farm, near Chickering, which was owned by the Bishop of Norwich. It is believed that this park existed before 1119. In 1472 an indenture mentions ‘le Oldepark’ which suggests that a ‘new park‘ was in existence. When fashion began to change, and the demand was for a park in which to set a splendid house, the Old Park was abandoned in favour of a new site which could provide a suitable landscape setting. This was on the site of what is known as Oakley Park, a benign location in the Dove valley. In 1837 the site became officially known as Oakley Park under Sir Edward Kerrison, however the Hall was demolished in 1923. We are indebted to Rosemary Hoppitt for her excellent talk and providing so much information on the changing face of Hoxne since the eleventh century.